This spoon is an indispensible tool for scooping out a pumpkin. 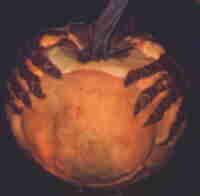 After the seeds and slime are scooped out, the spoon can cut through the pumpkin's flesh. Thinner flesh creates a warmer glow. The beauty of carving pumpkins is the deceptively simple effect caused by the light cast through the varied thickness of the pumpkin flesh. Remember it's just a vegetable. Never let yourself be intimidated by a vegetable. If it doesn't come out as you hope, there are more veggies out there. 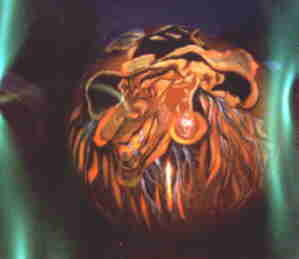 Notice how Flo's crystal ball glows. If you look closely, you can (almost) see the image of a ghost. He (she?) was carved in the inside. 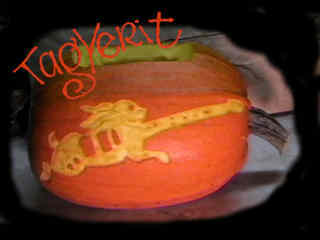 There's always a tool handy for carving pumpkins. Remember a sharp tool is safer than a dull one, because you don't need to apply as much pressure. These are wood working tools that we like to use when they are within easy reach. The long pointed blade is a reciprocating saw with tape wrapped around the blade for a make-shift handle. Also, always cut away from yourself. Your body should never be a tool bench. In other words imagine the path of your tools as it slips. If your other hand is in that imaginary path, move it now. (thank you). 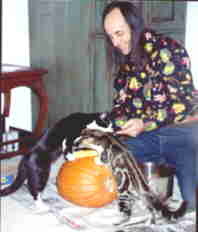 Just make sure to have your pumpkin stable so you don't have to hold it, and that you're always cutting away from your body. Recently I discovered that clay sculpting tools can help out. I found mine at a local crafts store. 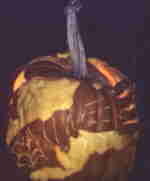 It's fun to carve pumpkins with children. First show them pictures of different possible approaches. Would they like to make a face or a house? 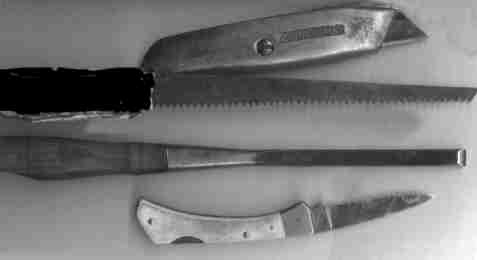 You'll have to be the judge of what age your children can handle knives, but there's plenty of stages for involvement. If you're letting them use steak knives at the table, they're probably ready. But repeat to them, the safety tips mentioned above - REPEATEDLY. Scooping out and sorting seeds for roasting. Put down newspapers. This part is slimy. Get them to try different sketches on paper. 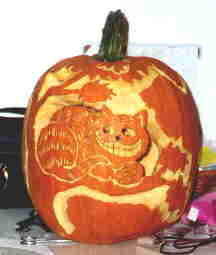 Then they can draw on the pumpkin with sharpies or magic markers. You can discuss which is the positive and negative space. Typically. I carve and cut away, the inked space. If you can't wash off the marker mistakes, then fine sandpaper may be in order, though usually a light abrasive like dampened Bon Ami works fine. There's no wrong way to design your pumpkin and there's certainly no pumpkin police telling you that you can't add-on for effect. 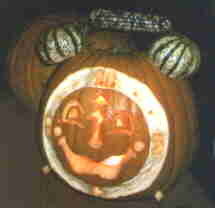 On the flip side of The Cheshire Cat Pumpkin, Flo of course carved just the smile. 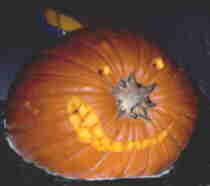 It also would have been effective to color or paint the cat and just carve the smile. About Patterns: People often ask me about patterns. We usually manipulate images that I find online using graphics software. You can do the same thing fairly cheaply with scissors and glue and your local copy shop to help expand and shrink pictures. One of our contributors, Rick Chong succesfully uses coloring books as a source for his designs. The pumpkins you find on these pages were either done by Rich & Flo Newman (aka TagYerit) or sent in by friends & contributors. There are more than 10 pages by now, so give yourself plenty of time to explore the vast range of wonderful creations assembled here! 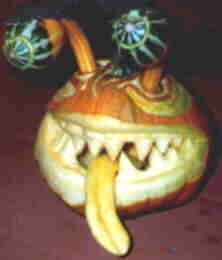 Try the following pages for more great pumpkins.